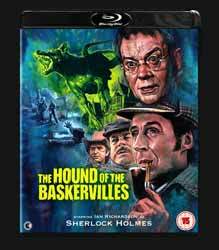 The Hound of the Baskervilles is easily Sir Arthur Conan Doyle's most famous Sherlock Holmes tale. I have to confess quite a fondness for the original, as I currently live in the heart of Dartmoor, the setting for the original novel. And by chance I've happened across many of the stories original inspirations (The grave of the coachman Harry Baskerville, who is said to have shown Arthur Conan Doyle around Dartmoor, is in St Matthew's church, Landscove; the grave of squire, Richard Cabell in the grounds of the burnt out Holy Trinity Church, Buckfastleigh; Fox Tor Mires, which was the inspiration for Grimpen Mire; and the real Baskerville Hall, which was inspired by either Hayford Hall or Brook Manor, both near Buckfastleigh). The location shots were filmed on Dartmoor and the scenery is unmistakable. But there are serious problems with this adaptation, most of which are explored in the interesting audio commentary. Most notable is the introduction of Brian Blessed's rather over the top drunkard and Donald Churchill's rather out of character Watson. I also had an issue with the way this feature was presented. Back in 1983 TVs had an aspect ration of 4:3, whereas most TVs produced nowadays have an aspect ratio of 16:9. As the picture on this movie fills the entire screen of a standard widescreen TV, with no noticeable stretch to the picture, it appears that the image has been zoomed into fit, with the top and bottom of the screen being cropped. Why on earth would a production studio do this if they've gone to the trouble to release an old film that will only really appeal to fans of the original? This suspicion was pretty much confirmed on several notable scenes where the framing seemed incredible odd, with the tops of heads being chopped off. For extras we get an interesting audio commentary with renowned 'Holmes’ expert David Stuart Davies. He repeats some of the information on The Sign of Four, but it's only information that's important about the background of the series. This is an interesting listen, as Davies tells us many facts about the actors, the deviations from the original book, and general background information. He also is not a fan of Churchill's Watson. It's a shame that the planned six movies never happened, as Ian Richardson makes for an impressive Holmes, and is arguably the closest we've seen to Conan Doyle's original creation. Sadly, the odd presentation of the picture may be too much of a distraction for serious movie collectors.